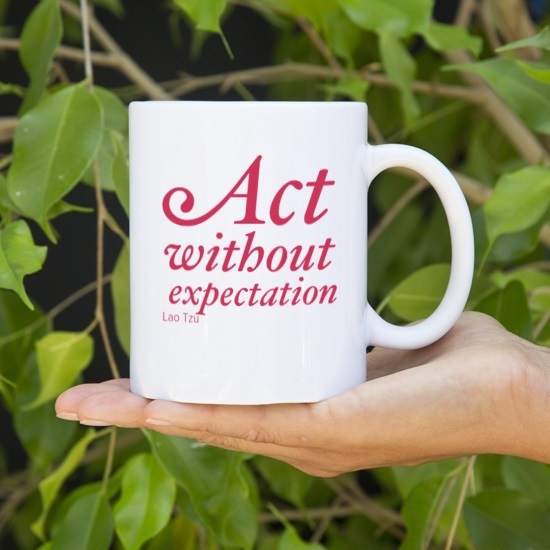 Posted on January 4, 2014 by J.
I found this quote from Lao Tzu, the author of the Tào Té Chīng, on a t-shirt at Stratford Shakespeare Festival in Ontario, Canada. It captures all that we are talking about in terms of feeling your emotions without censoring or judging them, and responding to what you get from your scene partner. The exercise we did in the last class of 2013 – reading from “sides” – is all about acting without expectation. All you knew was the name of your character and her relationship with the other character (“friends”). You knew nothing about the play – what it was about, where the scene was taking place, what had preceded it in time. You knew nothing about your character – her age, her wants, her background. All you had were her words, but even those were a surprise to you as the scene went along, because I didn’t let you read them ahead of time! You had no idea what the other character was going to say to you, because sides only show you your lines. And so you couldn’t form expectations in advance, although you probably were quite busy making them as the scene progressed! You began the exercise just trying to say your lines on time, but by the end had begun to listen to your partner speak. I hope that part of what you got out of the experience was a sense of how much you can learn about a scene from what you get from the other person. Because you didn’t know what was coming, you had to pay closer attention to what you were getting from her. Not only did you listen to what she was saying to you, suddenly how she was saying it became more important. Why does the “how” matter? Let’s say that you’re walking across the street and someone pushes you from behind, so firmly that you stumble forward several steps before you can steady yourself to turn and see who it was who gave you that shove. You are probably a little irritated that you’ve been shoved, but you can’t really know how to respond or to whom your anger should be directed until you turn around and evaluate the situation. If you turn around and see someone you’ve never met grinning with an evil look, because he pushed you just for the hell of it, you’ll feel one way. But if you see your long lost brother, who was simply trying to get your attention, you’ll feel another way. If you discover there was an out-of-control skateboarder who came out of nowhere, and the person behind you was just shoving you out of the way, you’ll feel a third way. But if you see that a brutal fight erupted between two gangs and you were knocked by one of the fighters, you’ll feel a fourth way. Until you know what you’re getting from the other people on the street, you can’t know how to react. The emotions that arise in you as a result of that shove don’t come with the shove – they come after the fact, once you are able to put the shove into context. On stage, how words are said puts them into context, and you must let how they are said “land” on you. In other words, you must “receive” before you can “react”. Most untrained actors skip receiving and move directly to reacting. Of course, it’s easier to wait to get input in real life, when the future is unknown. On stage, you’re at a disadvantage. Not only do you know what happens next in the scene, you’ve rehearsed it many times. You have to train yourself to stop thinking ahead and instead pay attention to what you are ACTUALLY getting from your scene partner – NOT what you got from him the last time you did this scene. When you listen not just to the words someone else says, but also to how they are saying it, you have something to react to. You react to their emotions, their needs, their demands on you. You empathize or dismiss them; solve or ignore; acquiesce or deny. But whatever you do, whatever you say and how you say it, it is directly related to what you are getting from the other people in your life, right at that particular moment. Don’t do anything or say anything until a need arises in you to do or say something. And if that means waiting for that need to arise in you – do! See The Hardest Part of Acting here. See The Open Door Reading here. This entry was posted in Acting, Staying in the Moment and tagged Acting, acting technique, Actor, Community Theater, Rehearsing. Bookmark the permalink.